Trying to make the blackest material known to man may not seem like an important issue until you see how much light interferes with our telescopes and prevents us from seeing distant stars and learning more about the world outside of Earth. Surrey Nanosystems have just started commercial production of this new Vantablack coating which is 10 times darker than the paint Z306 currently used to coat high tech materials making them reflect less light. More importantly, Vantablack can be applied to metals such as aluminium with good adhesion and resistance to shock and vibration making them more robust than previous nanotube coatings. This is what makes this technology unique as previous nanotech based black coatings have had a tendency to peel off easily making them unsuitable for many applications. The technology uses carbon nanotubes to create the blackest coating ever invented confirmed by measurements of the lowest reflectance across the light spectrum all the way from the UV to the far infra-red. The coating absorbs 99.965% of incident radiation meaning that a mere 0.035% of radiation that hits Vantablack is reflected. 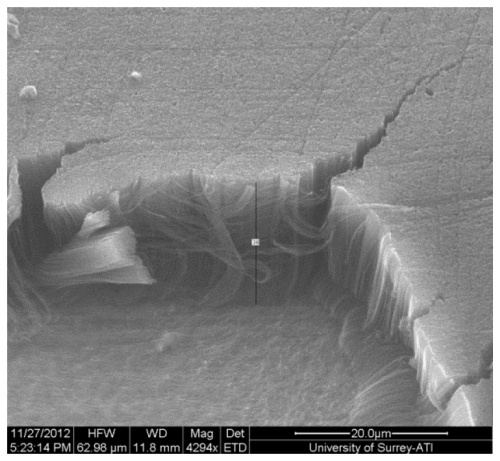 The coating consists of vertically aligned carbon nanotubes which can be seen in this scanning electron microscope image. The coating works by packing vertically aligned carbon nanotubes closely enough together that they allow light (photons) to come in, but then don’t let the photons out again. This is because the incident radiation strikes the material but then bounces around within the nanotube structure and all but a minute amount of the radiation gets absorbed. The plan is to start using it on space technology such as telescopes. Right now when light enters a telescope it gets scattered because it reflects internally within the structure. Currently a special black paint called Z306 is used to try to reduce some of this internal reflection, however light contamination still results in up to 40% of the data being unusable because of the poor signal to noise ratio. By using Vantablack as a replacement to the black paint, much less internal light reflection will occur giving higher quality signals from our telescopes and possibilities of viewing more distant stars. There is also discussion of using the coating on stealth aircraft and other military equipment to make it ‘invisible’ due to a lack of shape perception. What I find most incredible about the coating is that when you pick up a material coated in Vantablack it will mess with your brain as it looks like a 2D surface even if you crumple it up in your hands. This is because your eye can’t see any creases or features due to the lack of light reflecting off, meaning that it will just look like a dark hole no matter what shape you fold it into. Hmmm, a fabric that can reduce the appearance of lumps, bumps and wrinkles…….I might just get my sewing machine out! If it absorbs all those photons, does that mean it will be heating up as a result? That was the first thing I thought, but I notice you’ve also said it absorbs even into the far infrared, and I’m not sure if that would mean it then wouldn’t radiate heat like regular materials?